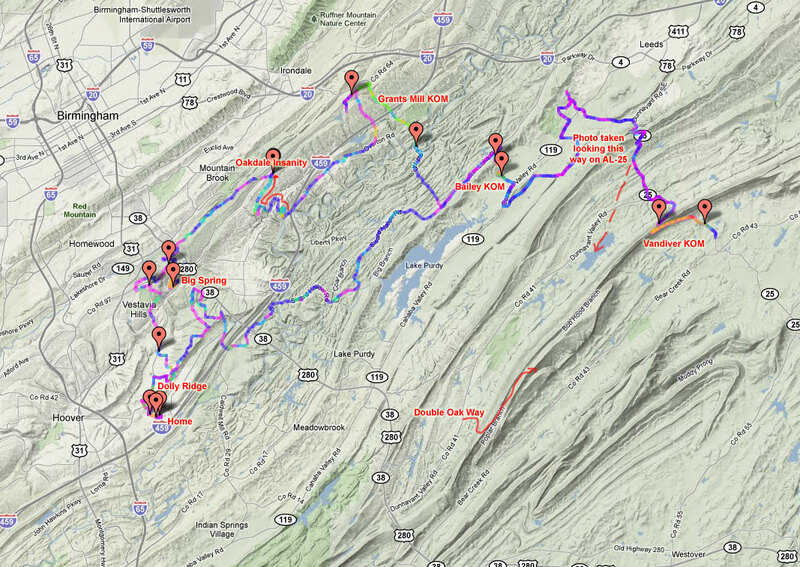 Beautiful fall ride … strava kom style! What a beautiful fall day today with temps never even making it out of the 60s! 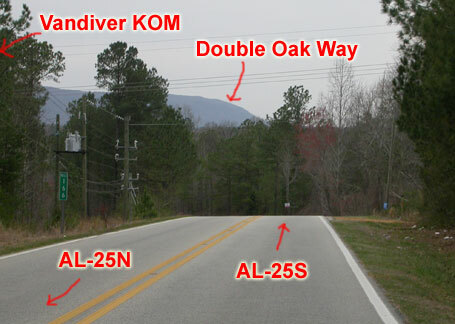 I had set aside today to take back a KOM that is one of my favorites here in Birmingham – the Vandiver KOM climb. So after Analise’s soccer game this morning, I headed out on what would turn into one of the funnest training rides of the year. I started out pretty easy to the point of actually getting passed by somebody on the Dolly Ridge climb. You have to understand riding in Birmingham to know that it is entirely possible to do an 85 mile ride on a Saturday and not see a single other person riding, so to encounter another cyclist less than two miles from my house, and to be passed by that person was a bit of a shock. It took quite a bit of discipline to continue on up the climb at an easy tempo and let whoever it was ride away up the climb. I headed up Dolly Ridge, did the tornado loop in reverse, down through the Colonnade, out Sicard Hollow to Rex Lake over Bailey eventually to Elliot and up the first of the ridges where the photo at the top of this post was taken a few years ago. I climbed up the steep side of Vandiver at a nice steady tempo, headed down the descent, turned around at the bottom and headed back up to try and break my teammate Paul Tower’s KOM time. I couldn’t remember his time exactly, but I knew if I was close to 6 minutes that I would beat it. I started out in my big chainring thinking that I would switch to my little chainring towards the middle of the bottom steep part of the climb. Instead, I found that I was nearly over the steep part before losing all of my momentum from my initial surge at the bottom. I decided to power through the last remaining steep part at the bottom in my big ring to avoid having to shift down and then back up again. This worked well because my speed never dropped below 15mph so I entered the less steep part of the climb carrying some momentum and was able to accelerate back up to nearly 20mph by the middle flatter part of the climb. I started to fade again towards the switchback at the top, but I used this switchback to push myself to the top thinking of the Tour de France commercial about the temporal nature of pain. 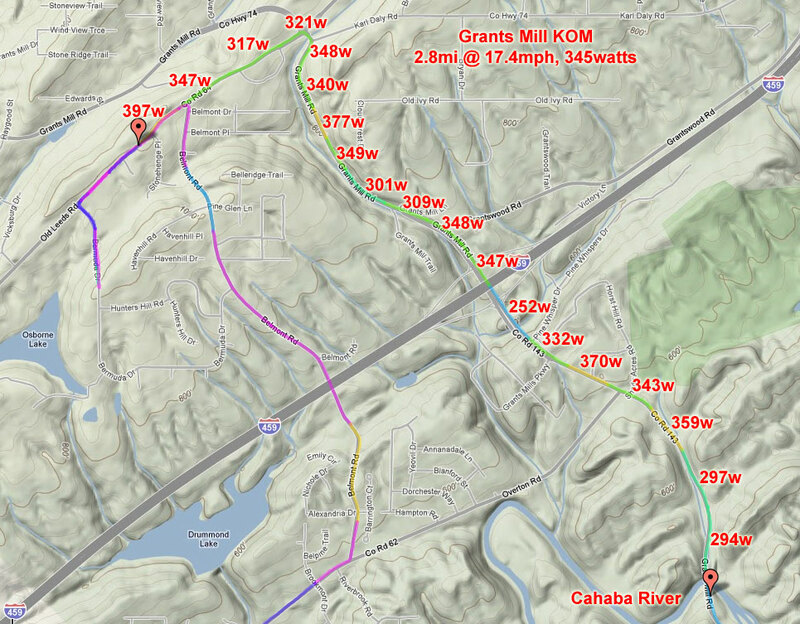 The rest of the ride flew by, and I ended up setting KOMs on Bailey Rd, Grants Mill into nasty headwind, and Big Spring, so by the end of the ride I was completely drained. 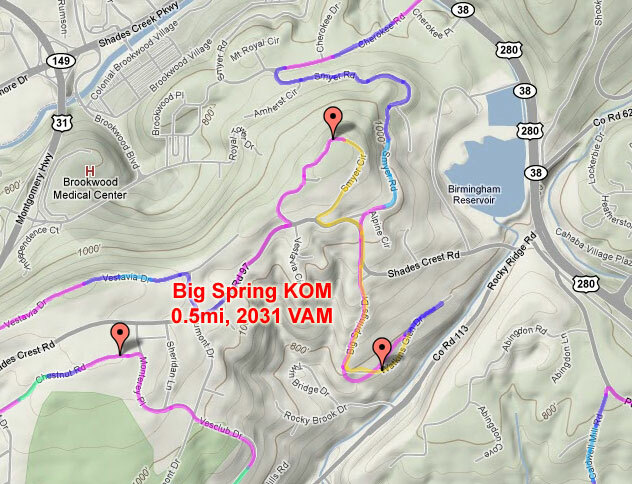 But the main highlight for the latter part of the ride was setting a new all-time max VAM of 2031 m/hr on the short, steep 0.5mi Big Spring Cat 4 climb. I double-checked the elevation and it is recorded correctly (no atmospheric drift) 300ft in just 0.5mi for an average gradient of 11.6%. I averaged 10.9mph, 417 watts for the super steep section with my weight at this point of the ride probably down to around 140 pounds and 12.9mph by the top of Smyer Circle. I can’t even count how many times I have ended a hard training ride at the top of Smyer Circle knowing that I can just cruise on home from there! I was out of food and hungry, though, so I kept on pushing to get home and ran into John Karrasch heading the other way to the crest of Vestavia Dr on his mountain bike as I was heading down. 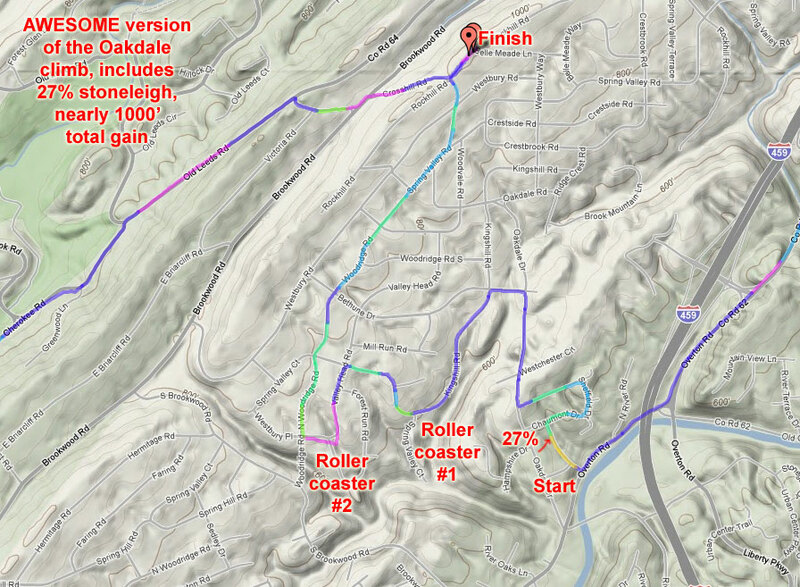 Another highlight on the latter part of the ride was a first ascent of Oakdale via a crazy climbing route I mapped out last night that has nearly 1000 ft of climbing, one 27% section, a couple other 20% sections, and a couple very fast roller coaster sections. And the final highlight of the ride was making it back home to find my son and daughter playing with chalk on the front sidewalk with a friend and to have them so happily welcome me home! 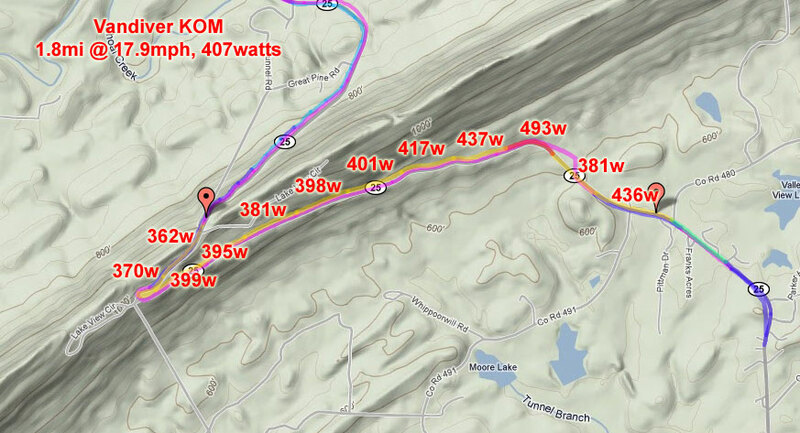 This entry was posted in Training and tagged kom, power, strava on October 1, 2011 by kartoone. Beautiful day. I was on my ’83 Trek 500 frankenbike. Vintage, baby. Awesome, was that the same bike that you used to ride Cheaha this year? Impressive! Yeah, it was setup as a fixed gear but now has some Dura Ace 9 speed stuff on it. Find out all about my 3rd place finish (1st American) in the 2017 Race Across America! Click the toone2015 link above to read about my 7th place finish in the 2015 Race Across America. Just found this brand new, never used 700x19 tire in the basement ... the crazy old days of super narrow tires. Super happy about skyway this past weekend, I was passed by 56 cars in nearly exactly 30 hours of riding (29:57:57). This morning on my commute into work I was passed by 57 cars in the first 15 minutes of my ride before I got to the really busy road (Columbiana Rd) where I was passed by another 78 cars in less than 10 minutes, I think the grand total by the time I made it to work in 35 minutes of riding was just over 150 cars. Something has to change. People are using these roads to avoid i65 altogether. We need to build bike lanes, bike paths, and restrict the roads that cars can drive on. I’d be willing to sacrifice some roads to “no bikes” as long as there was an equal number of “no cars” or “residents only” roads. I don’t know if that’s the exact solution, but we need to become much less car-centric as a society. It is not sustainable, and people 100 years from now will look back at us and laugh/cry/mourn at the American infatuation with travel by car depending on the state of the world at that time. Wow what a difference a year makes! 2019 skyway and 2018 skyway. So much the same, so much different. Totally awesome. AT power estimated by critical power curve in Golden Cheetah, which predicts I should be able to maintain 315 watts for 1 hour.